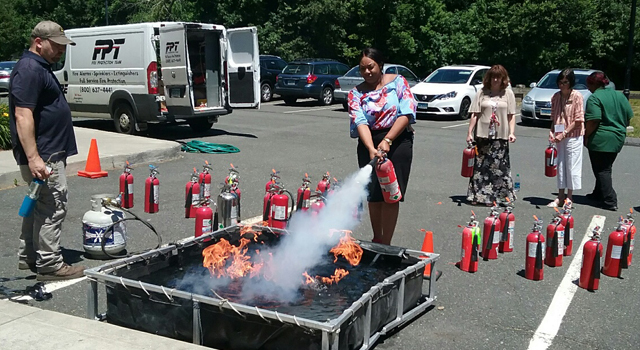 WEST HARTFORD – Hoffman SummerWood staff practiced putting out fires recently during their fire safety training session with Fire Protection Team (FPT) trainers. A staging area with a large vat of flammable liquid and dozens of fire extinguishers was set in SummerWood’s parking lot. After a full briefing on the proper use of the equipment, each staff member had an opportunity to “Pull, Aim, Squeeze, and Sweep (P.A.S.S. )” their own fire extinguisher. After each fire was put out, it was relit for the next staff member. 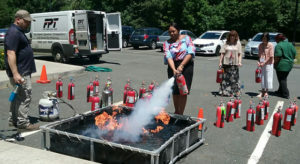 Shown here, Fire Protection Team’s Jay Patterson looks on as SummerWood employee Ashley Walker demonstrates her fire extinguisher skill.